1. Unlock the left side front door using the key blade. The alarm will be triggered. 2. 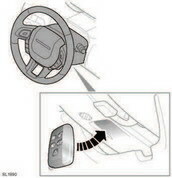 Position the Smart Key against the underside of the steering column cover with the buttons facing downwards. 3. Now press the START/STOP button.